'Wreck' regulars will have noticed the gap in posts. I've been away - Christmas in my second favourite place in the world: the Isle of Mull. Magical. Anyway, I'm back now and New Year bluesy so decided to look for an island wreck. Most of what's available are pricey plots or tarted-up holiday cottages, but here are a couple of properties worth a look. Isle of Skye Estate Agency has the former croft pictured above for sale at £120k, with the option to buy one or two adjoining plots of croft land. The plots of land come with planning permission to build on them. 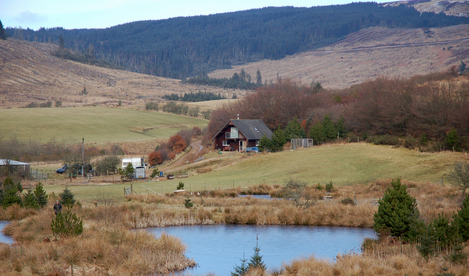 The house is part-renovated and live-in-able, with two bedrooms in the loft space and great views across Loch Vatten. It's in Ardmore, around six miles from Dunvegan and its castle. Details and pictures here. If you're looking for something bigger than a croft, Bell Ingram has Auchareoch Farm, on the Isle of Arran, for sale at offers over £275k. There's the three-bed, Swiss-style farmhouse you can see in the picture below and around 51 acres of mixed-use land, including farm buildings, animal sheds (the current owners run a herd of rare breed cattle) and trout ponds. 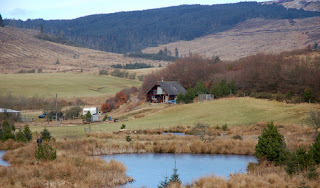 It's in a great position near Kilmory, within secluded woodland. More details and pictures here. 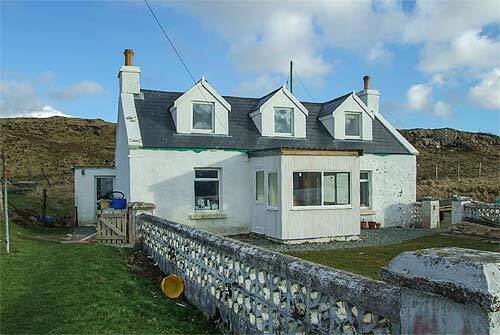 If privacy and price are your thing, the Isle of Lewis is still a fair chunk cheaper to buy on compared to Scotland's more southerly islands, with plenty of properties on the market at under £100k.